How to we get there???? 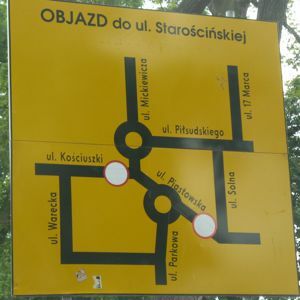 Objazd is Polish for detour -- Detour in any language isn't good for foreign drivers! If you remember, we were trying to find a rather LARGE castle in Poland. We could see it, but we couldn't get to it, and this sign just made us laugh! Just HOW were we supposed to get there from here??? International Road Signs - Do You Know What They Mean? That's the great stuff for a site like this. Detour sometimes can be pretty perplexling for the locals too and when it comes to Poland things become a bit rough. As I recall, this was funnier after we finally made our way to the castle! I thought we did pretty well all in all. Glad you were driving!